"Thonet rocking chairs - Sedie a dondolo Thonet"
"It is interesting to see that all forerunners of the rocking chair are furniture for children. The idea that the swinging motion has a sedative influence, since it reminds one of the embryonic swinging motion in the mother’s womb, cannot be dismissed. Maybe this is the reason why we associate feelings of peace and cosiness with a rocking chair, even when we only look at one. The first rocking chairs made for adults were side chairs or armchairs converted to rockers by placing them on runners. First examples from the 18th century seem to have been made in England, but this type we find in many other countries, too. Chairs on runners had surely been executed before the time that craftsmen and cabinet makers produced them specially. In this connection Benjamin Franklin is an interesting example. He is said to have transformed one of his conventional chairs into a rocking chair in 1787. Thanks to this anecdote he is often considered to be the inventor of the rocking chair, but the sources show that rocking chairs of this type were already in existence both in America and Europe around 1740. Beside these examples, there is a special model from Sweden, the “Gungstol”, where the runners are lengthened at the back to accommodate two additional legs to give the backrest additional support. So we have a rocking chair with six legs. One must not forget the “Boston” rocking chair, developed in the middle of the 19th century in New England and a variation of the Windsor rocker. Several spindles extend above the main back topped by a larger crest rail and a wood seat that curved down in front and up in the rear. This rocking chair is the first mass-produced one, since it was for the first time mostly made by machine. We do not intend to deal with other models and variations of this kind such as the shaker’s or wicker work rocking chairs, or different national or only regional developments, but it is interesting to see that at the beginning of 19th century this kind of furniture is offered very frequently. As the rocking chair is a piece of furniture which is used exclusively in private rooms, studies dealing with economic, sociological or other reasons could be important for the assessment of this development. Let’s turn our attention now to the “Winfield” rocking chair, thought by many to be the predecessor and example of the first rocking chair made of bent-wood. This rocking chair got its name from a company that produced this type, too, the “R.W. Winfield & Co” in Birmingham. It was shown by this company at the First World Exhibition in London in 1851. However, the origin and design of this rocking chair do not go back to the “R.W. Winfield” company. Many studies have tried to find out where this rocking chair comes from, where it is mentioned first. As it is not the task of this summary to reopen this discussion, we will confine ourselves to the result: According to all that is known today, a certain John Porter from London is the first producer of this type of rocking chair. But is he the designer, too? No one knows. What is new about this rocking chair? The differentiation between legs and runners is dispensed with. This consolidation of elements produced a radical design of sweeping simplicity. This design was only possible by the use of an iron frame. Its plain form countered the popular taste for “heavy” decoration. This rocking chair is very basic, elegant, and even puristically simple: it is constructed from two iron frames made of metal tubing - later executed in bands of flat metal, too – and cross sections between which an upholstered cushion is put. 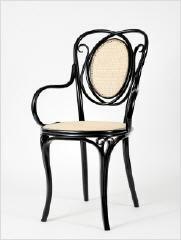 Michael Thonet was able to “translate” the “language” of this kind of furniture into bentwood. With the help of his new technology it was possible for the first time to create new forms that were unthinkable before being executed in wood. We can summarize that the development of the Thonet rocking chair no.1 and all of the models of the classical series cannot be seen independently of the development of contemporary design. It must be seen in a historical context. This assessment is as banal as it is correct. But what makes up the uniqueness of Michael Thonet is the combination of a perfect and unswerving feeling for form, the knowledge about the possibilities of bentwood and the application of these two aspects in creating furniture. He has created products, which even today are still considered modern, since in his best designs he anticipated what the 20th century would demand: form determined by functionality. Form and functionality have become one. This not only applies to rocking chairs but to all early seating furniture, whose inimitable elegance even today, 150 years after its creation, is inexplicably fascinating to everyone. Michael Thonet leads a list of great designers of the 20th century. Marcel Breuer, Alvar Aalto or Charles Eames were inspired by his work: the perfecting and the immaculate mastering of the bent-wood technique as well as the timeless design had a decisive influence on their work." The book was published in Italian and English language.